Arrive Allahabad or Prayagraj and transfer to Tourist bungalow (on banks of River Yamuna) to freshen up. After breakfast boat-ride to Sangam - The Triveni Sangam in Allahabad is a confluence of three rivers, the Ganga, Yamuna and Saraswati. Of these three, river Saraswati is invisible and is said to be flowing beneath the earth. It meets the other two rivers from the base. The point of confluence is a sacred place for the Hindus. A bath here is said to wash all the sins and free human from the cycle of birth. The site of Sangam is a treat to the eyes. One can see the muddy and pale yellow water of Ganges merging with green water of Yamuna. Once in every 12 years the Kumbha Mela is held here which attracts tourists, saints and pilgrims from all over the world. Followed by city tour of Allahabad -Visit Nehru Bhawan - The ancestral home of the Nehrus, the Anand Bhawan now houses a memorabilia of the Nehru-Gandhi family and one of the excellent museums of India. Khushro Bagh - This huge garden houses the mausoleums of Khusrau, his sister, and his mother, Allahabad Museum - preserves the paintings of Nicholas Roerich, terracotta figurines, Rajasthani miniatures, coins and stone sculptures from the 2nd century BC till date and Allahabad fort (which is under army so only a part of it is included in sightseeing) - Built by Akbar in AD 1583, the Allahabad Fort exhibits fine depictions of art, design, architecture, and craftsmanship of the fort. In the afternoon, transfer to Kila Ghat and sail to Sangam and onto Sirsa by a wooden country boat (approximately 5 hours by boat). Lunch on boat. Arrive Sirsa in the evening and transfer to Sitadham Camp/ Sitamarhi Guest House for overnight stay. In the morning sail from Sitadham/Sitamarhi to Rampur Ghat (approximately 4 hours by boat). Breakfast on boat. Lunch at Rampur Ghat. 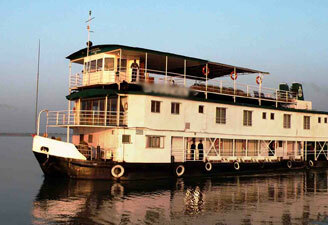 After Lunch, sail from Rampur Ghat to Mirzapur via Vindhayachal Dham. On arrival Vindhayachal dham, visit Vindhayachal temple. Overnight stay at Hotel in Mirzapur. Sightseeing of Chunar including visit to an Indian village, 'Guashala'- Derived from the Sanskrit terms "gau" meaning cow and "shala" meaning center or house or abode, Gaushala means a center or house for cows. Also visit Chunar Fort. After lunch, sail from Chunar to Varanasi via Sitlamata temple and Shool Tankeshwar temple. Arrive Varanasi by dusk and twilight to see the Ghats of Varanasi by night.